The Beauty of Life: Beauty Questions: If You Could Only Buy One Product a Year, What Would It Be? Beauty Questions: If You Could Only Buy One Product a Year, What Would It Be? I have a beauty product buying problem. I tend to buy tons and tons of mascaras, lipglosses, eye creams, body washes ... you name it, I've got tons of them lying around my apartment. But in these trying economic times, I've been thinking about ways to cut back -- and, much as it pains me to say it, there might need to be some trimming of the pocketbook when it comes to buying products. So my Beauty Question to you, my lovely readers, is this. If you could only buy one product a year, what would it be? Yes, I know it's extreme. But if you had to choose, where would your dollars go? My choice is simple. 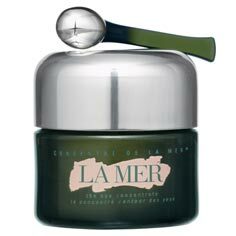 It's La Mer The Eye Concentrate. At $180, it's not cheap by any means ... but it keeps my eyes looking quite young, it makes my skin feel supple and smooth, and it just really makes me feel like I'm living in the world of luxury. Nothing better or more important than that! What would be your one product bought in a year? Let me know in the comments! Okay, this is going to sound crazy, but it is my honest answer. Origins Well Off Fast & Gentle Eye Makeup Remover. I know it's not pricey (at $13.50) or something that miraculously changes my complexion on contact, or anything like that, but it is the one thing for which I have never found a suitable replacement!